Eight persons B, J, K, M, T, V, W and Z are born in different months of the same year viz., June, March, July, May, August, October, December and September. They are all like different flowers namely Iris, Jasmine, Lily, Daisy, Tulip, Carnation, Aster and Dahlia but not necessary in the same order. 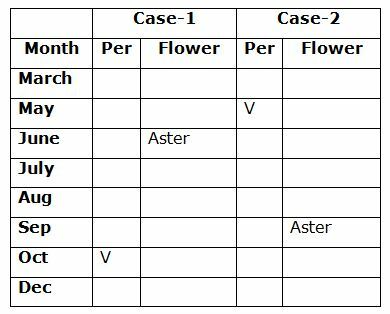 Three persons are born between V and the one who likes Aster, who does not born in the month which has odd number of days.Two persons are born between T and the one who likes Dahlia, who is not elder than T. J was born immediately after the one who likes Dahlia but not in the last month of the year. The one who likes Iris was born immediately after M. As many persons born before M is same as the persons born after the one who likes Lily. The one who likes Iris does not born in the month which has 30 days. Only one person born between Z and the one who likes Daisy, who is younger than Z. As many persons born between the one who likes Carnation and B is same as between the one who likes Daisyand B. B does not like Dahlia.The one who likes Jasmine was born immediately after K. More than two persons are born between J and the one who likes Jasmine. 1. M was born in which of the following months? Three persons are born between V and the one who likes Aster, who does not born in the month which has odd number of days. 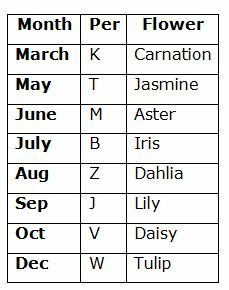 Two persons are born between T and the one who likes Dahlia, who is not elder than T. J was born immediately after the one who likes Dahlia but not in the last month of the year. The one who likes Iris was born immediately after M. As many persons born before M is same as the persons born after the one who likes Lily. The one who likes Iris does not born in the month which has 30 days. Only one person born between Z and the one who likes Daisy, who is younger than Z. 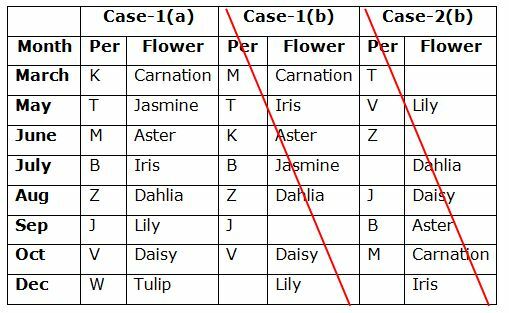 As many persons born between the one who likes Carnation and B is same as between the one who likes Daisy and B. B does not like Dahlia. The one who likes Jasmine was born immediately after K.
More than two persons are born between J and the one who likes Jasmine. 2. How many persons are born between V and the one who likes Iris? 5. If V is related to Jasmine and K is related to Tulip in a certain way. Then, B is related to which of the following? 6. J, K, L, M, N and O are sitting around a circular table and facing the centre. Who among them sits opposite to J? I. K and L are sitting opposite each other. M and J are does not sit opposite to N. II. N sits to the immediate left of K and sits to the immediate right of J. How is ‘artist’ is written in the code language? ‘how is her son’ is written as ‘xn sn an bn’. ‘what he said’ is written as ‘fn dn mn’. From the both statements, ‘artist’ is coded as ‘hn’. How is N related to A? I. V is the brother-in-law of T. K is the daughter-in-law of J, who is the husband of A.
II. S is the mother of N. K is the sister-in-law of S.
We can’t conclude the relationship between N and A.
P, Q, R, S, T, U and V are sitting in a straight row and facing north. Who sits third from the right end? I. V sits second to the right of T and none of them sitting at the extreme ends of the row. Two persons are sitting between S and P, who is an immediate neighbour of T.
II. Only three persons are sitting to the left of V. U sits third to the right of T, who is not an immediate neighbour of V.
Among 27 students what is the rank of Ajay from last? I. Vikram ranked 14th from the top. Only five persons are ranked between Ajay and Vikram. II. Kannan ranked 19th from the last and only 8 persons are ranked between Ajay and Kannan. Kannan is ranked 19th from the last. So, there are only 8 persons ranked before the Kannan. Then, Ajay is ranked 10th from the last. 1) M was born in which of the following months? 2) How many persons are born between V and the one who likes Iris? 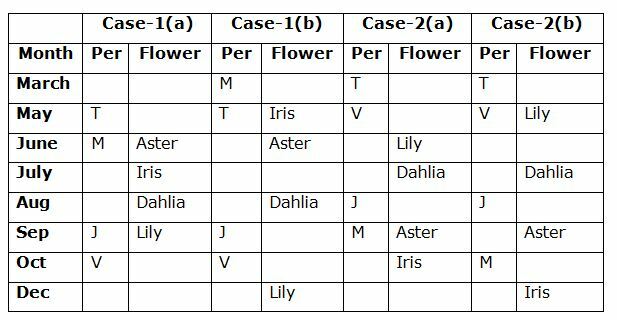 5) If V is related to Jasmine and K is related to Tulip in a certain way. Then, B is related to which of the following? 6) J, K, L, M, N and O are sitting around a circular table and facing the centre. Who among them sits opposite to J? I. K and L are sitting opposite each other. M and J are does not sit opposite to N.
II. N sits to the immediate left of K and sits to the immediate right of J. 7) How is ‘artist’ is written in the code language? 8) How is N related to A? 9) P, Q, R, S, T, U and V are sitting in a straight row and facing north. Who sits third from the right end? 10) Among 27 students what is the rank of Ajay from last?